The Lexus LF-A will debut at the Tokyo Motor Show this evening, which may explain why someone was bold enough to drive around Miami in the first completely undisguised version we've seen. Gallery of the $400K Toyota below. 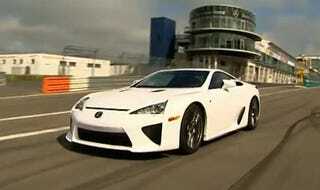 Lexus LF-A: Clearest Look Yet! The vehicle was spotted by user Adrey at the NAGTROC forums. We've seen plenty of versions tarted-up versions, but this person appears to be driving what seems like a full production version, as opposed to those camo'd LF-As running around the 'Ring earlier this year. We'll learn more soon, but we at least now know it'll carry over the RemoteTouch system that debuted on the Lexus HS this year. UPDATE: Now there's video of it, the dam of LF-A news is breaking.